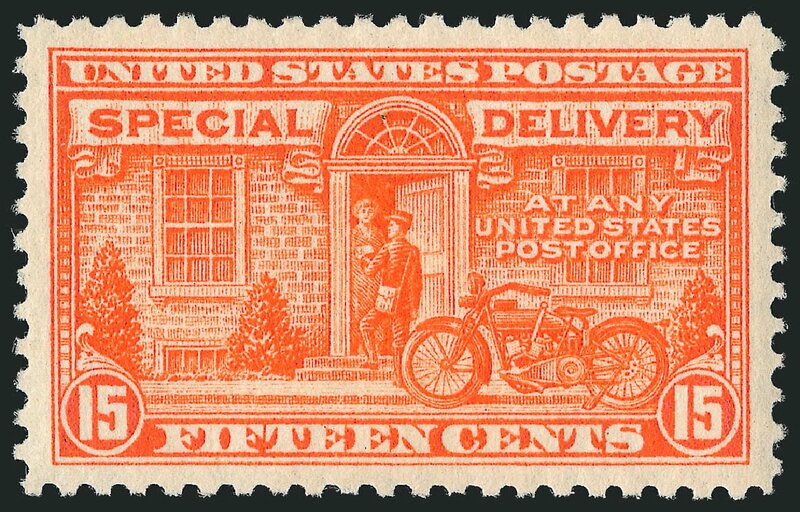 USA (Scott E13) 1925 MOTORCYCLE 15¢ DEEP ORANGE MINT never hinged wide top margin plate #16859 single. Fresh & bright, extremely fine. (2014 PSAG Cert #0568011) Cat $75. 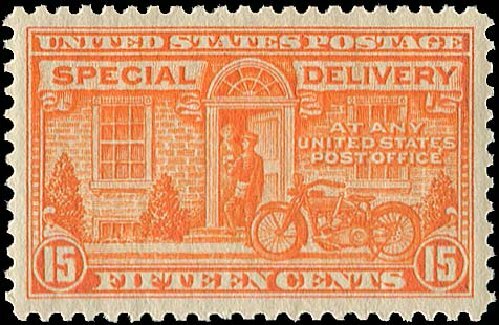 U.S.; Special Delivery, 1925, 15¢ Deep Orange on FDC, Scott #E13, block of 15 with two plate “16857” numbers, used with ½¢ Hale (551) plate # “17029” block of 12, tied by “Washington D.C. Apr 11 1925” duplex handstamps on large cover addressed to Worden in Milburn N.J., very fine. Estimate value $300-400. 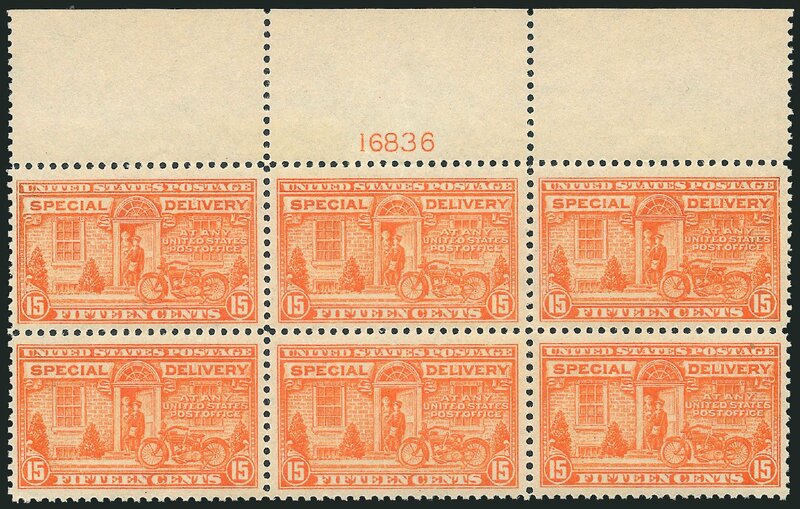 Special Delivery, 1925, 15¢ deep orange (Scott E13), left plate block of 6, o.g., very lightly hinged (black offset on gum), choice well centered multiple, Very Fine. Scott $450. Estimate price $200 – 300. 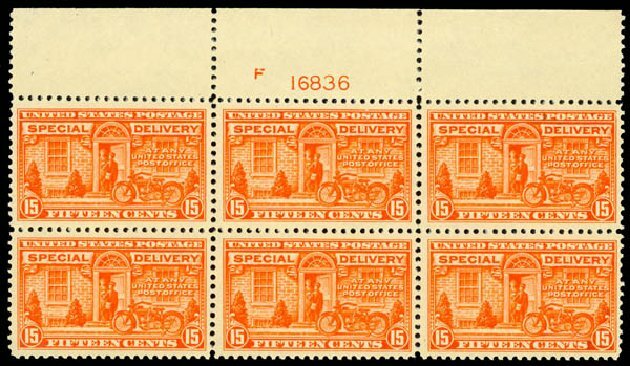 Special Delivery, 1925, 15¢ deep orange (Scott E13), bottom plate block of 6, o.g., never hinged (minor gum bends), a fresh and pleasing multiple with robust color, a scarce plate, Very Fine. Scott $700. Estimate value $400 – 600. 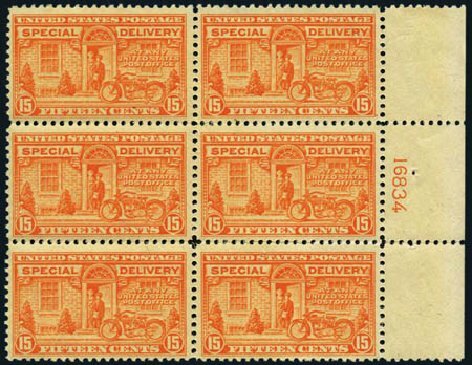 Special Delivery, 1925, 15¢ deep orange (Scott E13), bottom plate block of 6, o.g., never hinged, impressive example of this elusive plate block, with brilliant fresh color in Post Office fresh condition, Very Fine. Scott $700. Estimate price $400 – 600. 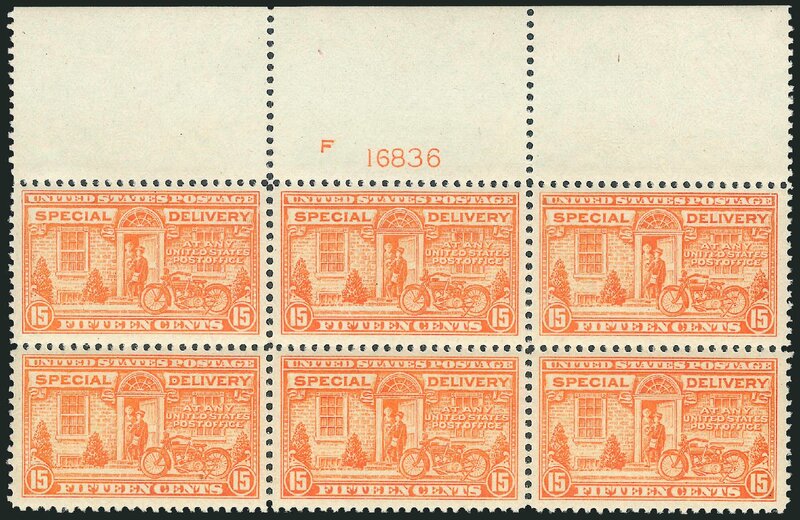 Special Delivery, 1925, 15¢ deep orange (Scott E13), top plate block of 6, o.g., never hinged, choice example of this elusive plate block, with deep rich color, Fine to Very Fine. Scott $700. Estimate value $250 – 350. 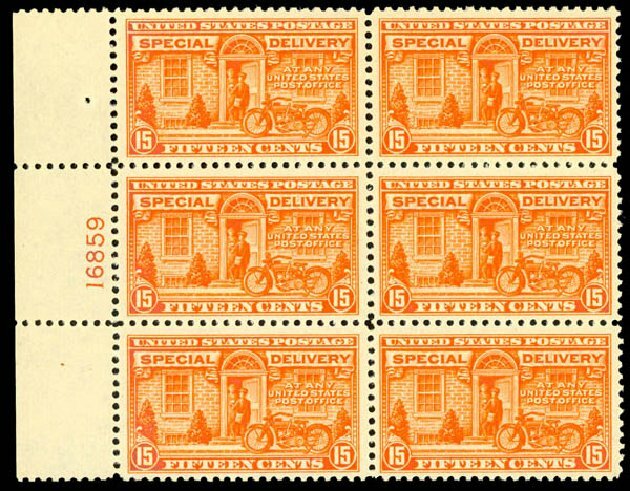 U.S.; Special Delivery, 1925, 15¢ deep orange, plate block of 6, #E13. Side #16859, slight oxidation at top, well centered, n.h., Fine to Very Fine. Scott $450. Estimate price $100. 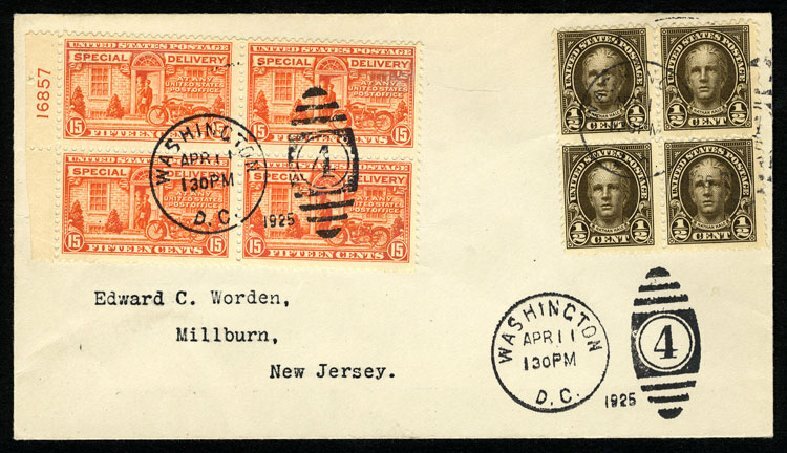 United States – First Day Covers First Day Covers Special Delivery 1925 15c Motorcycle and 1/2c Nathan Hale, block of four of each, on Washington, DC, April 11 FDC addressed to Worden, v.f. 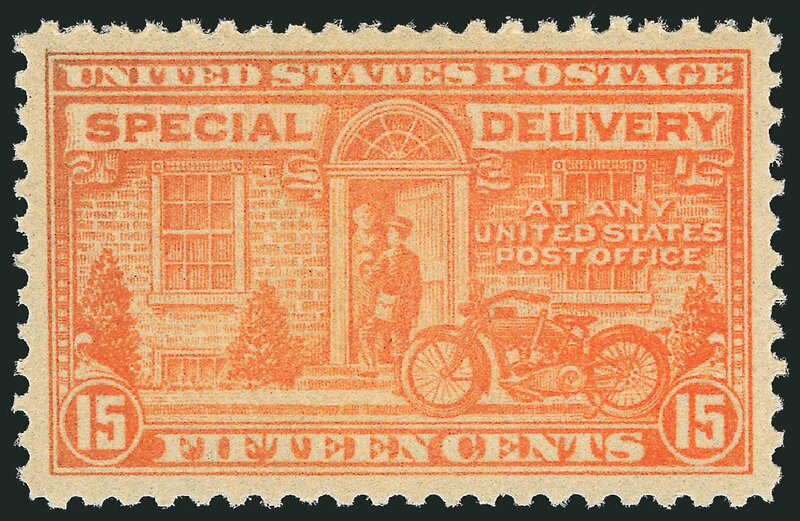 Special Delivery, 1928, 15¢ deep orange, “Special Paper” printing (E13 var. 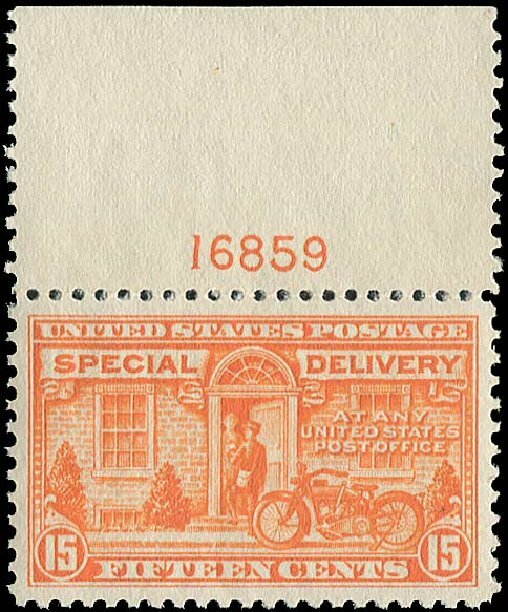 ), top plate block of 6, o.g., never hinged, among the finest known examples of this rarely offered “Special Paper” printing of 1928, a gorgeous wide top with bold rich color, accompanying certificate specifically identifying this as the “Special Paper” variety, Very Fine, 2006 P.F. certificate. Scott $650 for normal paper. Estimate value $1,000 – 1,500. 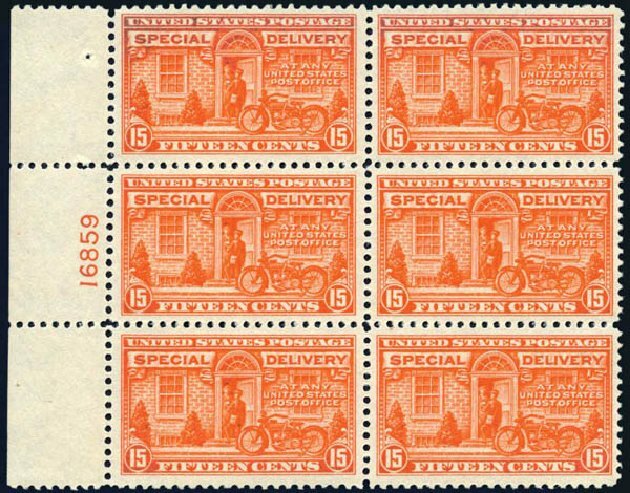 U.S.; Special Delivery, 1925, 15¢ deep orange, side plate block of 6, #E13. 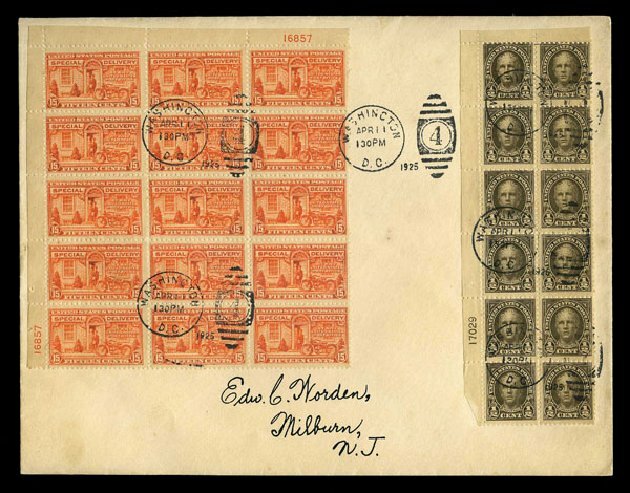 N.h., large tab #16834, Fine to Very Fine. Scott $550. Estimate price $160.